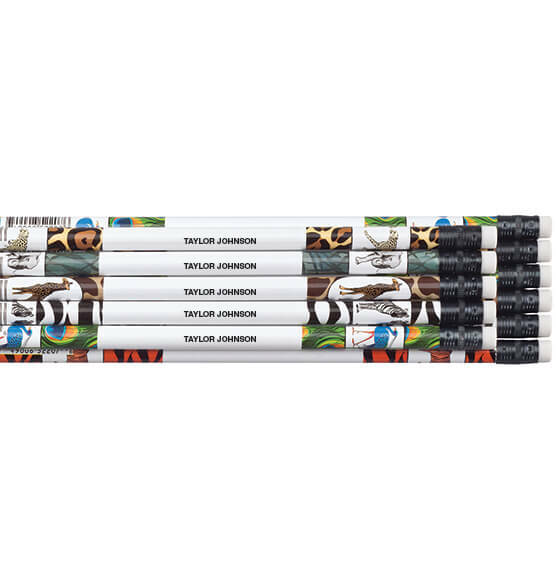 Kids of all ages are wild about these personalized pencils featuring favorite zoo animals and bright safari patterns. If you’re on the hunt for a one-of-a-kind gift, choose any name or message, and we'll print it on these quality personalized zoo animals pencils for FREE. Be conservative (John Doe), romantic (I Love John), businesslike (John's Plumbing), even bold (Call Me John). The real fun is personalizing these #2 custom pencils for fundraisers, parties or gifts. The personalized pencils come in assorted colors; we'll choose for you. Specify name or message; limit 1 line, 30 letters/spaces. 1 name or message per set of 12.